Do you believe in horoscopes? I do and I don't. The rational part of me wonders how the same set of rules can apply to one-twelfth of the population? And can how different astrologers see different things in the same set of stars? The romantic part of me wants to believe in fate and destiny and that sometimes a higher power is in operation. There's one particular astrologer whose monthly forecasts I read. She gives these really long, comprehensive insights with each horoscope and sometimes they're so delightfully vague in over the length that she does indeed cater for pretty much anything happening to anyone in some veiled comment or another. I tend to read them when I'm having a bit of a navel-gazing time in my life. Introspective and uncertainty always drives me to look for someone else to give me the answer. My other foible is that I tend to read them towards the end of the month so I can say 'Oh so that's why xyz happened' rather than at the start of the month when she'll say something that I interpret to mean I'm going to win the lottery when in fact at the end of the month, I actually just found a forgotten tenner stuffed in the pocket of my winter coat or something similar (this month I did win £3.10 on the Euromillions though). Of course, this month she said that I was due the best weekend of the current decade, ever, over the weekend of 12-13th May. Well excuse me, but if that was my best weekend of the decade then I'm in for a bloody bumpy ride up until 2020! But equally, she was right about a career decision that I'd been pressured to make. She suggested waiting for the right thing to come along. I chose not to do as I was told and wait. All without reading the horoscope first so I like to think she's right. About me and the other half billion Capricorns in the world. One other thing she mentioned was the current Venus retrograde which would put a kibosh on some of my creative plans. And yes, life has now tampered with my blog plans for today and tomorrow. 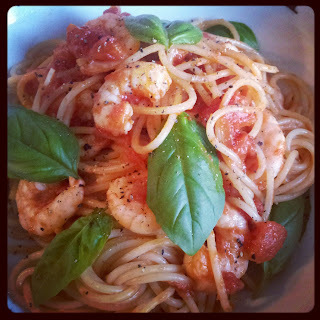 So instead of a nice Pimms jelly, planned in advance of the jubilee celebrations and with the hot weather we had been having in mind, I've now had to bring you a pretty pleasant summer pasta dish from the BBC Good Food website at the last minute. Fresh, storecupboard stuff. Quick and easy for a last minute dish after a long day at work. And healthy too. I also blame the Venus retrograde for compromising my plans to make my jubilee bundt tomorrow. An action-packed day of work followed by a Jubilee party at Miss A's nursery (I'd intended to make cake for that too but the week has just vanished) and a trip to the doggie doctors in the evening has left me severely short on time and inspiration. Now wondering what the June horrorscope will hold but of course, I can't look for another thirty days.